Hannibal Lektor as a secret agent! I’m sorry but Anthony Hopkins performance as ‘Hannibal The Cannibal’ was so successful, and much imitated, that it has now moved beyond a mere performance in a movie, to being a part of popular culture. No matter what Hopkins did in the past or may do in the future, now he will always be compared to, or judged as Lektor. But long before The Silence Of The Lambs, Hopkins portrayed a cold, ruthless secret agent in this adaptation of Alistair MacLean’s novel, When Eight Bells Toll. Back in 1970, Hopkins was in reasonable shape and it didn’t seem like such a stretch for him to play a two-fisted, highly skilled secret agent. This is not the case in the recent film Bad Company, where he seemed completely out of place. The film opens at sea, with secret service agent, Philip Calvert (Hopkins) in scuba gear. He surfaces near a large freighter at anchor, and proceeds to haul himself up the anchor chain and onto the deck. He makes his way to the radio room and opens the door, only to be looking down the barrel of a gun. The man holding the gun has a steely gaze and doesn’t waiver a muscle. Calvert begins to realise something is not right. This bloke doesn’t speak or move at all. Calvert moves closer and takes the pistol from the man’s hand. The movement causes the radio operator to topple over revealing a knife in the centre of his back. He is dead – just propped up to seem life like. This is someone’s idea of a joke. As Calvert searches more, he finds another dead body. Who are these two men? I am glad you asked, but to find out we have to flash back to a few days previously. A helicopter lands in the gardens of a giant white mansion. This building is in fact Secret Service Headquarters. Calvert alights from the helicopter and is met by Hunslett (Corin Redgrave). Hunslett, although an agent, specialises in intelligence gathering and does very little field work. He outlines there current problem to Calvert. It appears that several bullion ships have been hijacked at sea. In the film it is never adequately explained why gold bullion would need to be transferred by ship – but let’s just take it as a given that it is important. These ships are hijacked and the crews are taken to Ireland where they are released a few days later. By this time the ships have vanished. Calvert and Hunslett have to come up with a plan to stop the theft and round up the people responsible. The plan they come up with involves hiding two men to act as radio operators on board the next bullion ship. If it is hijacked, the men will transmit the ships location at designated times, and Calvert will follow behind in another boat. It will come as no surprise that the two men chosen for the mission are the two men that Calvert found dead in the opening sequence of the movie. Calvert and Hunslett don’t have free reign though. They are answerable to Sir Arthur Arnford Jones (Robert Morley). Jones is a stuffy bureaucrat who doesn’t like Calvert’s brash and arrogant manner. But against his better judgement, Jones allows the plan to be put into action. It’s another eccentric performance from Robert Morley, not too dissimilar to his role in Hot Enough For June – but whereas Hot Enough For June was a gentle comedy, this film is a straight laced action adventure. Thankfully, half way through the movie, Morley gets with the program and pulls it in, and the film is all the better for it. Every good spy film has a villain, and in When Eight Bells Toll it is shipping magnate, Sir Anthony Skouras. Playing the part is seasoned character actor Jack Hawkins. Hawkins looks quite ill in this movie, and his dialogue has been looped by Charles Gray. 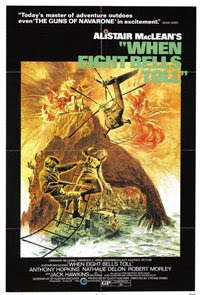 When Eight Bells Toll is actually a pretty good little movie. It may not have the globe trotting excesses of a James Bond film, but it has some fine set pieces, and drips with atmosphere. The cinematography around the Scottish coast is as breathtaking as it is inhospitable. At times, you can actually feel cold and a little sea-sick when watching this film. There’s one action scene that I think warrants a special mention, which involves a helicopter that Calvert is travelling in, being shot out of the sky and crashing into the sea. The scene is tense and well staged. All in all, this is a good one and worth looking out for.